Take Highway 1 south from Carmel California for approximately 10 miles to Soberanes in Garrapata State Park. 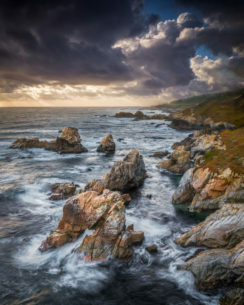 This image was taken in Garrapata State Park in Big Sur, California at a place called Soberanes. This location is about 10 miles south of Carmel California, just off Highway 1. It was a Sunday when I spotted these large rain clouds (Nimbus) developing to the north. It’s unusual to see this type of cloud on the Central Coast of California, so I grabbed my camera gear and headed to Garrapata. My home is in Monterey California, so I’m very close to the Pacific coast and can get to Garrapata quickly. I realized that to capture the clouds I would need a subject that had to be photographed in a northward direction. My first thought was to go to Soberanes and photograph the famous sea arch from the high cliffs overlooking the ocean. As I arrived the clouds continued to develop and now left the entire coastal area around Soberanes in shadow. I started to photograph the scene using my Sony A7RII with 24-70mm f/4 GM lens using auto bracketing exposures to get as much information recorded as possible. My settings for the auto bracket were normal, +2ev and -2ev. I felt so lucky to capture this beautiful scene. When I got home, I reviewed the images and decided to use one of the overexposed images from an auto bracketing series as the foreground and the normal exposed image as the sky. The overexposed shot really brought out the detail and color in the rock where the sky shot kept all the detail of the highlights in the clouds. I processed the images using Lightroom and Photoshop. In Lightroom I did some initial adjustments on the raw images such as exposure, color balance and chromatic aberration. Then I opened these images as layers in Photoshop where I merged the two images by using luminosity masks. I then manipulated different areas of the photograph using masking to adjust exposure color balance and contrast. Once done the image was then processed again in Lightroom adjusting the contrast and setting both white and black points. Sony A7RII with 24-70mm f/ 2.8 GM lens at f/16 and 30mm for 1.5 seconds at ISO 50.